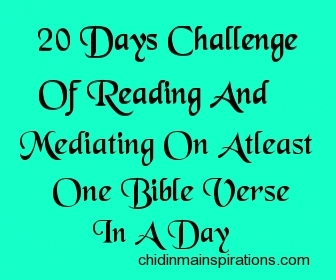 So, which bible verse did you read & mediate on today and what did you learn from it? 1 Thessalonians 5: 18 which says ''In every thing give thanks: for this is the will of God in Christ Jesus concerning you''. Jeremiah 29:11 which says ''For I know the thoughts that I think towards you, saith the Lord, thoughts of peace, and not of evil to give you an expected end''. In every thing either good or bad that comes our way, we should always find the strength especially in the bad to give God thanks for this is His will towards us. And the bible also made us to understand that God's thoughts for us are thoughts of good and not of evil to give us an expected end, in some bible version it says to give us a bright future. God is not a fool. He will never allow His children to serve Him and end up in shame, He will never allow darkness overcome the light. He is constantly working because His Word can never be broken, so if He says He will give us a bright future in the end, be rest assured that He will surely do so. Be rest assured that it will end in praise. Be rest assured that there will surely be a light at the end of the tunnel. So beautiful people, how did you conquer your today's challenge? I love this! It said is the root of all sorts not some but all sorts of evil. Crave for a better life but don't obsesses over money cos it is the root of all evil. I see your paragraphs on your "what I learnt" contradictory. I totally disagree with your first paragraph. It's kinda fable. I don't buy in the idea that God is responsible for the bad things that happens to us. I never said God is responsible for them. All I said is, in all things either good or bad that we should give God thanks because no matter what He will surely give us an expected end (a bright future) but that is His towards us. Amen and am happy to be a part of the Bible reading challenge.